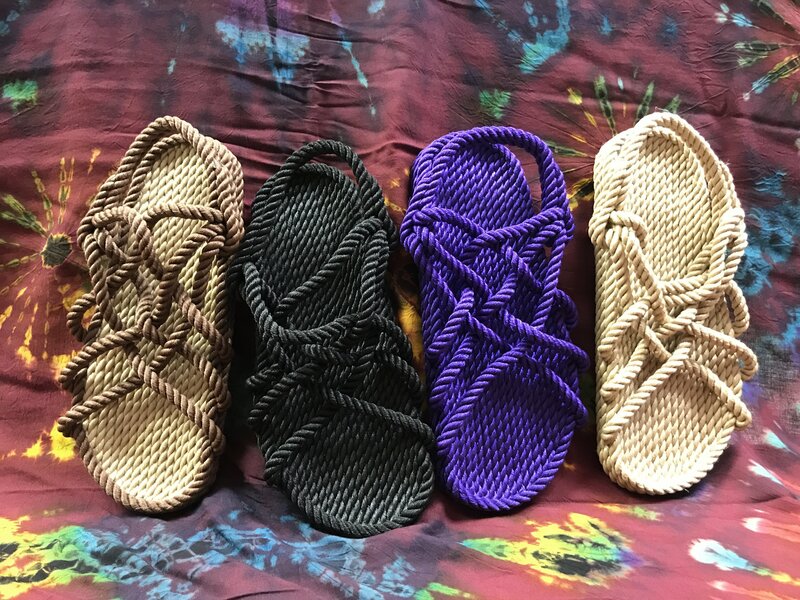 The ever popular Utopian Rope Sandals, hand-made by HIPPIES at EastWind Commumity in the Missouri Ozarks. We carry Utopian Ropes in the classic natural, black, two tone which is dark brown with tan and purple. Rope sandal sizes run a bit big, and are unisex sizing. It’s better than barefoot! Utopian Rope Sandals can be machine washed and put in the dryer! These are one of the few synthetic items that we sell at FOR MOTHER EARTH. Utopian Rope Sandals are made of polypropylene (recycled carpet fiber). We sell them because they are so long lasting. Many customers report their sandals lasting 15 years or more.